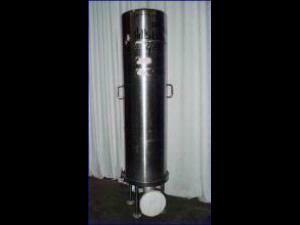 Nuclepore 12 round 40 cartridge filter housing with 3 inch flanged fittings. Polished stainless steel construction with slip off top. There is some writing with marker on these housings. These housings take finn style cartridges as they are set up now, but v-rods and springs can be added.